Mother Nature provides rain, so your tomatoes don’t need to be watered every day. If nature doesn’t provide 1-2 inches of rain each week, then you’ll have to drag out the hose. Water deep and consistent, not a “sprinkle a day” (easy to say when thunder storms are predicted). Put a rain gauge in the garden; it will help determine what your plants might need. Soaker hoses reduce the amount of water lost through evaporation and they keep the leaves dry, reducing the chances for disease. Water less as the fruit is ripening. Too much water right before you harvest can leave the fruit watery and pithy. To Prune or Not to Prune; that is the question. First refer to the differences between Determinate and Indeterminate varieties in Totally Tomatoes Part 1 – How to Choose. Know which type you have – some varieties offer both indeterminate strains AND determinate strains such as San Marzano Italian Plum. Why prune at all? All tomato plants need some form of training during their life. Getting them off the ground helps to reduce diseases, increases air circulation and avoids some pests. To manipulate these vines into a vertical position often requires pruning for structure. Removing “suckers” will increase air circulation, increase fruit size and can speed up the ripening process. An aggressive “top pruning” late in the season can force the plant to focus on ripening the fruits already developed rather than producing more fruit which will never have enough time to mature. Determinate varieties should not be pruned. When first planted in the garden, a rogue stem or two can be removed to initially shape the plant. After that, each stem you remove will eliminate one cluster of fruit. If you prune the suckers, all you’ll get is one cluster of fruit on the top of the plant. Determinate plants still need support; cages are often sufficient. Indeterminate varieties should have at least some basic pruning but they benefit most from regular weekly pruning. There are many options on how to prune indeterminate tomato plants – I’m going to share the method I’ve always had the most success with. First, decide how big – tall and wide – you are willing to let your plant grow. I’ve had Brandywine grow over 12 feet tall and 4 feet wide. Pruning, tying and harvesting from a ladder was more work than I will ever do again. Most of my plants today (regardless of variety) top out about 6′ with 3-4 width. I start pruning on planting day. I remove all lower leaves and stems below the top two pairs of leaves and bury the entire stem. No matter what support I use, it goes in on planting day. In the next month or so your plants will grow exponentially – often doubling in size every week. How far apart you plant your tomatoes will determinate how many “main” stems you can allow to grow. Since my plants have plenty of room and I use a trellis system (or very large cages), I allow 3 stems to remain. If you use stakes, a single main stem will be the easiest to control. As the plants grow, I identify the 3 sturdiest stems (yes these are “suckers”) to remain and completely remove all other suckers and leaves below the first flower cluster. When you remove the entire sucker, it’s called “simple” pruning and if the sucker is not too large, it should snap right off at the leaf node. Use pruning shears if the stem doesn’t snap easily. Once the first flowers form, I change to “Missouri” pruning for the rest of the plant above that first flower cluster. This type of pruning removes the growing tip of any suckers but allows the two leaves closest to the main stem to remain. 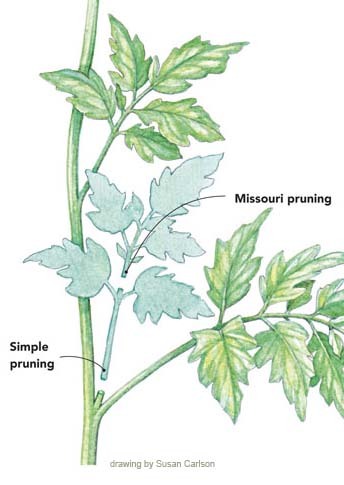 If your weekly pruning chores have gotten away from you and you have very large suckers to remove, Missouri pruning will cause less stress to the plant and be less likely to introduce disease through the wound. The overall goal here is to allow every leaf on your plant to receive sunlight to produce sugar to feed the fruit. If a leaf is shaded, it’s not doing the job the plant needs it to do. That leaf will yellow and drops off. If you allow many stems to remain on a plant (more than 3), much of the food that the leaves are producing will be used by the many growing tips of the plant. Generally more stems (main and subsequent sucker stems) means more but smaller fruit produced later in the season and a higher chance of disease due to poor air circulation around the plant. 1 Stem, 2 Stem, 3 Stem, 4! Finding the right balance is often easiest when you grow a few different varieties and prune each a different way. The final Act . . . of Pruning Late in the season many of your plants will start to look tired; yellowing leaves, smaller fruit, maybe some damage by pests, but there are still many fruits that are unripe. About 30 days before you expect your first frost, it’s time to “top prune” the entire plant. Even though I have been growing tomatoes for more years than I care to admit, top pruning is one of the hardest chores for me to do. It suggests I’ve recognized that summer is near its end. BUT, if I don’t radically cut off the entire top of the plant, I’ll end up racing into the garden some night in September trying to pick all those hard green tomatoes in the dark before the first killing frost, only to have most of those tomatoes rot long before they ripen. By cutting off all the growing vine tips, the plant will put all its energy into maturing and ripening the fruit that has already developed. Be tough! Grab the hedge sheers and cut the plant off flat across the top and nip off any of those stems that escaped your best efforts to tie or cage them earlier in the season. Tomatoes will often benefit from a light feeding through mid-season. Top dressing with compost or a small amount of organic fertilizer will help keep production up when the plants are getting full. Feed once at planting time, once again at first flower and a third time when the plant is about 50% flowers and 50% developing fruit. Don’t fertilize too late into the growing season as it can affect the taste of your tomatoes. This entry was posted in Garden Fresh, Totally Tomato! - From Seed to Harvest. Bookmark the permalink.